Wackydoodle sez: Ol' Watt jis swapped ends! Remember the Love Canal? It contained so much toxicity it actually turned the nearby plants and grass black, and caused human birth defects and miscarriages among those living in its proximity It became a symbol of industrial poisoning, and fostered the environmental justice movement. 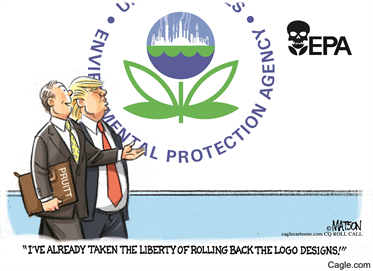 If Trump has his way, America's declining beauty and public health will be degraded once more after several decades of environmental progress under administrations from both parties. Trump's man at the EPA, Scott Pruitt, is a self-confessed polluter and climate change denier. He wants to role back tailpipe emission standards, and his right-wing constituency wants him to revoke California's authority to set its own, more strict, regulations. Fortunately, the chances of revoking the waiver authority under the Clean Air Act surviving a Democratic filibuster are low. This is just the beginning a renewed onslaught on America's natural heritage and the planet in the name of profit. Meanwhile, the corporate mass media's attention is being expertly diverted by "The Wacky Trump Horror Show" going on in Washington. The latest: Trump cites a Fox News commentator for the proposition that British intelligence (GCHQ) was responsible for the electronic surveillance allegedly ordered by Obama. The man is a superfund site of trash talk.